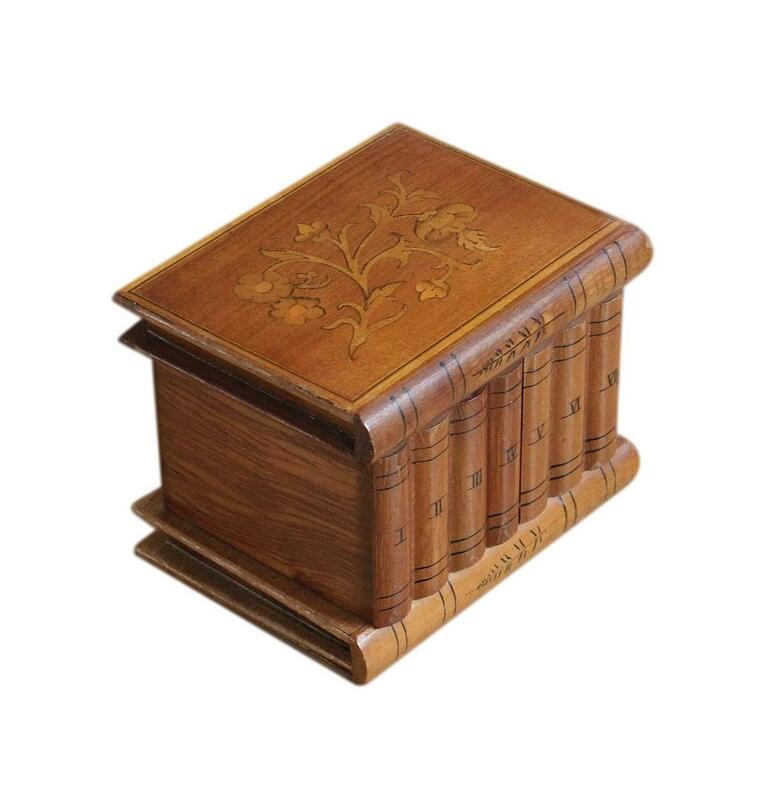 This is a lovely small vintage jewellery box, made in Italy in the 1970s. 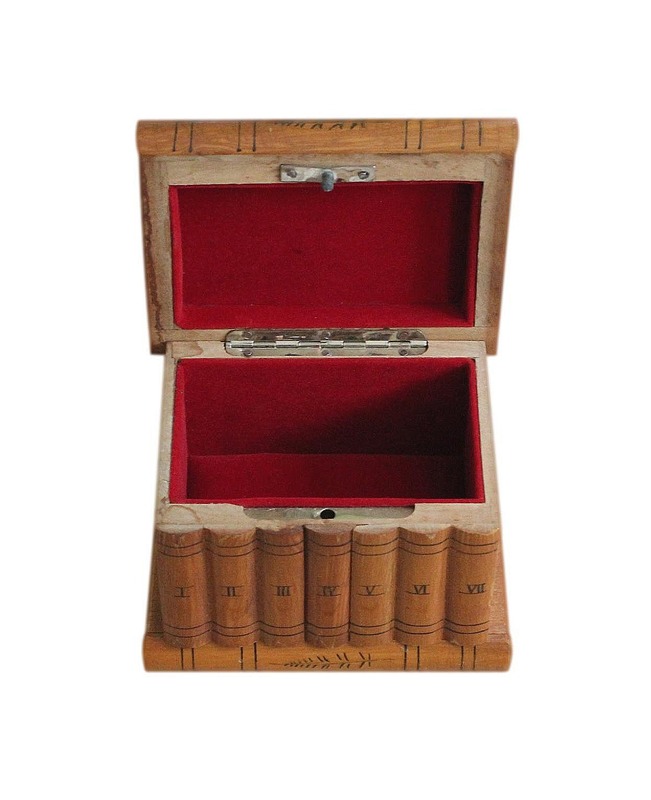 This box is in the novel form of a volume of books. 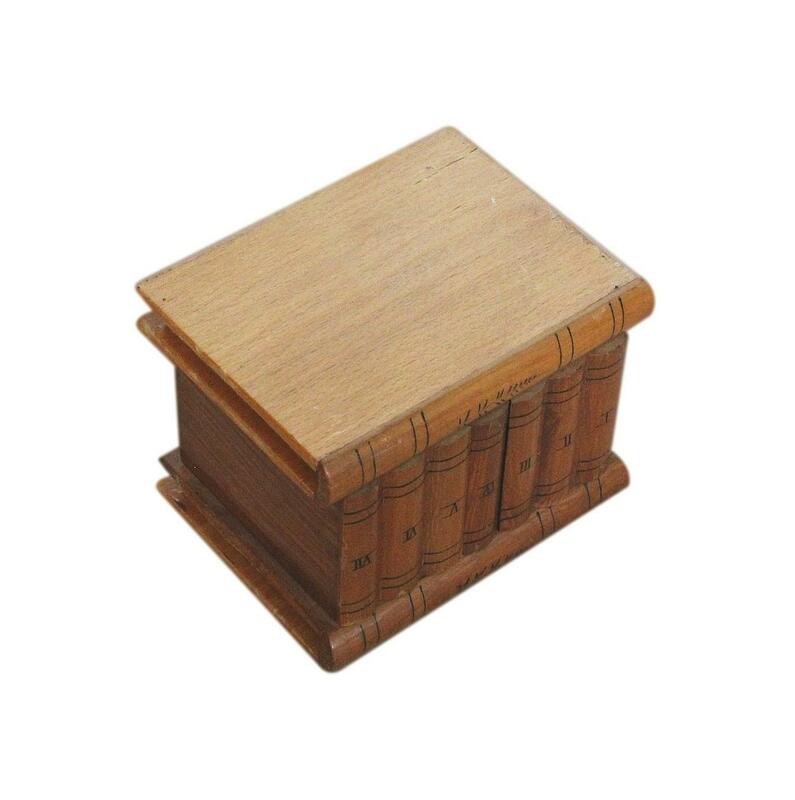 There are two books horizontally placed at the top and bottom, and a volume of upright books in between. These are numbered 1-7 in hand painted Roman Numerals. 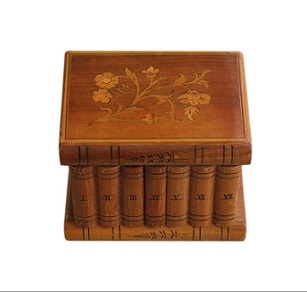 The top book is the lid of the box. 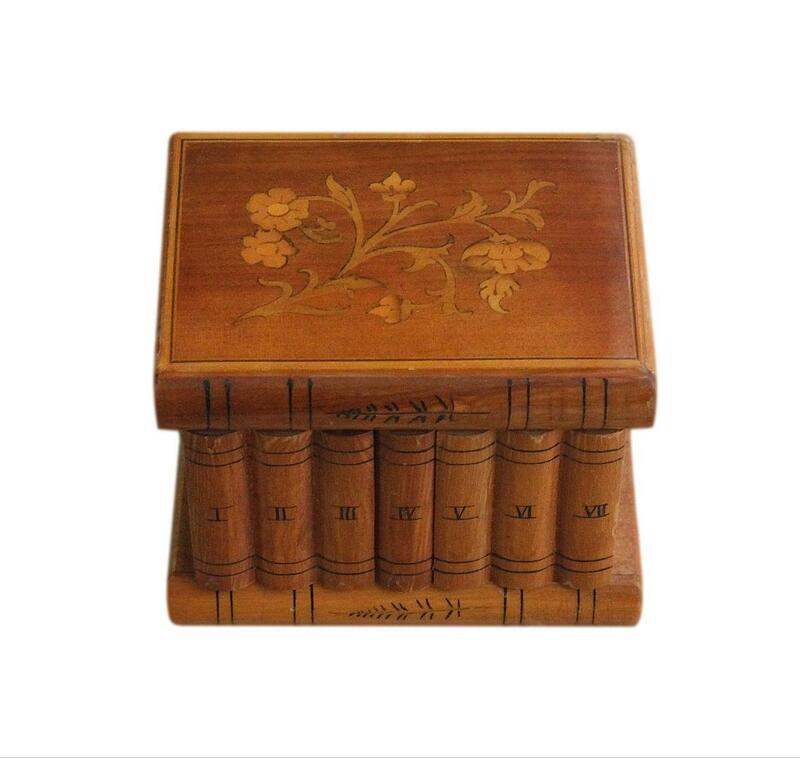 This has floral marquetry inlay set flush into the wood. There are pretty hand painted leaves to the spines of the top and bottom books. 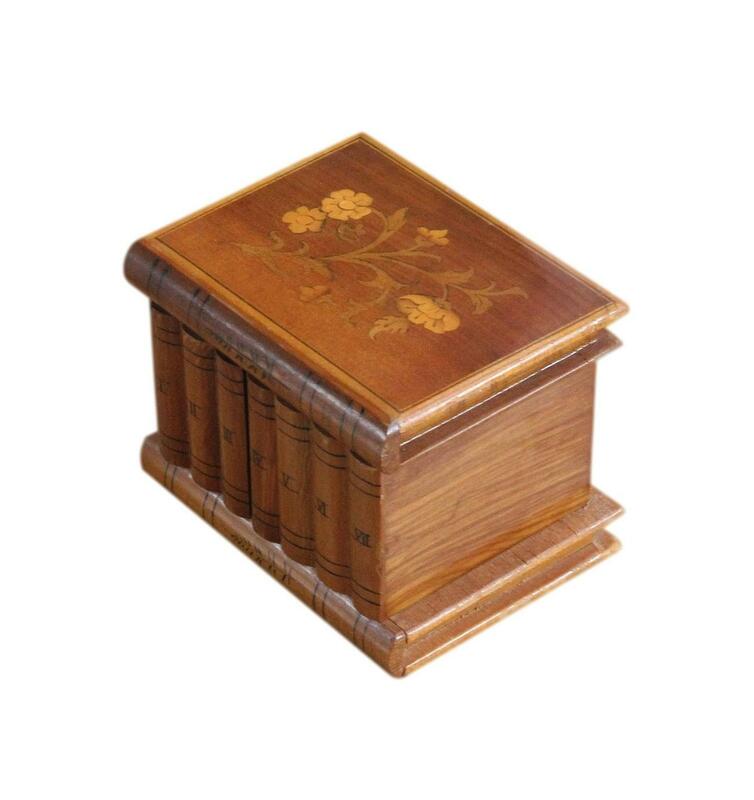 The wood has a glossy polished and varnished finish. The box is complete with its original polished white metal piano hinge. The interior has a single storage compartment. This and also the inside of the lid, have their original soft plush felt linings. The lining to the bottom of the compartment is padded. This lovely box is in good condition. There is some minor damage to the rear left and right corners of the box, and a slither of veneer missing to the back of the bottom book. These small flaws are not overly obvious and do not spoil the beautiful appearance of the box. All of the inlay is present and intact. The box once had a secret locking mechanism but this no longer functions. To open the box you simply lid up the lid. The interior linings are in good clean condition. There is one teeny mark to the lining inside the lid. The hinge is still in good working order. 10.0 by 6.4cm with a 5.4cm depth. UK. This box will be posted FREE within the UK by Next Day Special Delivery. International postage is £25 by Royal Mail International Tracked and/or Signed For post. Delivery is fast, within 3-5 working days to Europe and 5-7 working days to the rest of the world.